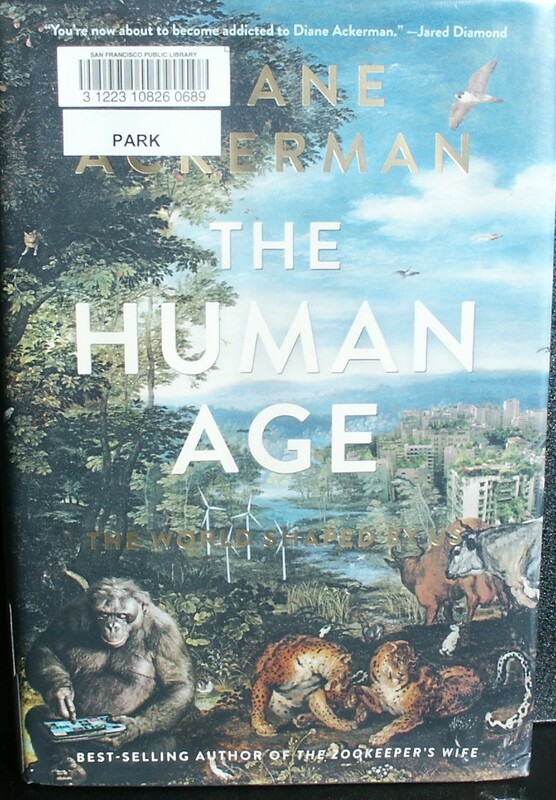 “The Human Age” is derived from the term “Anthropocene”, which was coined in 2000 as the proposed geological epoch in which humans have impacted the Earth’s ecosphere. This would start by some opinions from the dawn of agriculture, and others from the beginning of the Industrial Revolution in the late eighteenth Century, proceeding through the present until our effects cease at some point in the future. Diane Ackerman adds the fictional frame of a future stratigrapher digging through rock layers to study the residue left by humans thus creating a wide-angle lens through which to view the large-scale of this topic. After reviewing the changes human activity has brought about, such as the redistribution of plants and animals, the extinction of certain species, pollution, and global warming, she presents many of the innovations currently being worked on to mitigate these problems. Her tone is upbeat and optimistic which sets it apart from the apocalyptic visions of the future populating much of today’s literature and movies . The book serves as a survey of new technologies, solutions, and ethical dilemmas, and is presented in a poetic or novelistic style. Our book club felt that she steered clear of political bias and opinions on a subject which usually lends itself to passionate diverging viewpoints. I personally found it informative on one of the most important topics of our times.